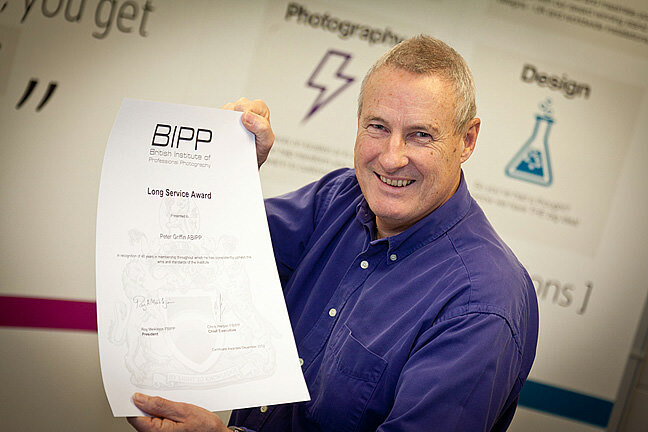 Our Director/Photographer, Peter, has just received an award from our professional body, the British Institute of Professional Photography (BIPP for short). The citation says – ‘This is in recognition of 40 years in membership, throughout which he has consistently upheld the aims and standards of the Institute’. That’s a lot of photographs! More to the point, the BIPP is the professional qualifying body for photographers and Peter has been closely involved with promoting the highest standards of photography and professionalism over the years. Even to the extent that at one stage he was elected as National President of the BIPP and has been a keynote speaker at many seminars and conferences. The experience of meeting so many leading photographers and gaining creative inspiration from them has stood Peter in good stead as he has applied fresh thinking and creativity to all his work. He’s still got the enthusiasm and is still shooting great work.